CHICAGO, IL--(Marketwire - Mar 21, 2013) - BMO Harris Bank announced with the Chicago Bulls that Songhai Elementary Learning Institute has been selected as their 2012-2013 Adopt-A-School partner to benefit from diverse educational programs, donations of materials and guest speakers throughout the school year. BMO Harris Bank also announced they will donate $1 for every point the Bulls score during the 2013 playoffs to Songhai Elementary through their "Scoring for Songhai" initiative. In a continuing effort to support excellence in education, each year BMO Harris and the Chicago Bulls choose a new Chicago Public School to be adopted. The program encourages CPS students to demonstrate a commitment to their education by excelling in their school work, and maintaining superior attendance records. During the pep rally held at the school, Bulls player Nate Robinson along with Benny the Bull visited the students, celebrating the school's achievement of becoming the 2012-2013 Adopt-A-School partner. In addition, BMO Harris Bank and the Bulls revealed they will donate funds to add PC and Mac stations to the school's college and career room, as well as two mounted air conditioners in their existing computer lab. Songhai Elementary will also receive special benefits such as tickets to Bulls games, appearances by Bulls personalities and tours of the United Center. "In partnership with the Bulls, we congratulate the great students of Songhai Elementary for their achievements in the classroom and the community," said Justine Fedak, SVP, Brand, Advertising and Sponsorships at BMO Harris Bank. "We hope to see a long Bulls playoff run, which no doubt will lead to a lot of points scored, making for a very significant donation to the school!" Before the pep rally, a BMO Harris financial expert led Songhai's sixth grade students in a lesson where they learned spending, saving and budgeting tips based on the bank's various free, online financial education programs. Adopt-A-School recipients are selected based off their application explaining: why they think their school should be the next "adopted school," what type of contributions it offers to help improve its surrounding communities, what the school hopes to accomplish in the community moving forward, and examples of ways the school can and will use the benefits if chosen. BMO Harris Bank provides a broad range of personal banking products and solutions through over 600 branches and approximately 1,300 ATMs in Illinois, Wisconsin, Indiana, Kansas, Missouri, Minnesota, Nevada, Arizona and Florida. BMO Harris Bank's commercial banking team provides a combination of sector expertise, local knowledge and mid-market focus throughout the U.S. For more information about BMO Harris Bank, go to the company fact sheet. Deposit and loan products and services provided by BMO Harris Bank N.A. Member FDIC. BMO Harris Bank(SM) is a trade name used by BMO Harris Bank N.A. BMO Harris Bank is part of BMO Financial Group, a North American financial organization with approximately 1,600 branches, and approximately $542 billion in assets (as of Jan. 31, 2013). 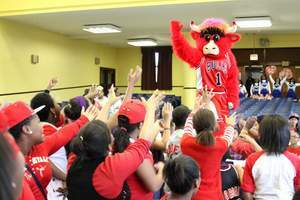 Chicago Bulls' mascot Benny the Bull leads the students of Songhai Elementary in a celebratory pep rally Wednesday, March 20.